You’ll be welcomed by someone from the welcome team in the front foyer and also in our Church lounge, where you can grab a cup of tea or coffee before the service. As you enter the worship area you will be given our weekly notice sheet, which you can also download from the front page. If it is your very first visit we will try and introduce you to someone who can show you around and make you feel at home. In the church lounge there are various notice boards, leaflets, and event information. The toilets are in the front and the back of the church and we also have a toilet for the disabled with baby-changing facilities. How to get to CBC? Please use the Contact us page for maps, directions and details of public transport. Once you’ve found us, there are a number of parking options. We have a small car park to the side of the building, and also a few reserved for disabled drivers. There are also free car parks behind Waitrose and St. Martin’s precinct and in Chester Street. Please see our Contact us page for maps of the area. Our worship band lead us in a mixture of hymns and modern songs of celebration, as well as more intimate songs of worship. Words to the songs are all projected on a screen at the front of the Church and the words are also available on a sheet for those who struggle to see the screen. Everyone worships in their own unique way – for many it may mean singing, clapping along and raising hands, for others it means quietly reflecting on the words. You are welcome to do whatever makes you feel most comfortable. What is the format of the Sunday services? Our Sunday morning service is generally led by one of our worship leaders and a visiting preacher. Each service will have an element of worship which includes the whole family, preaching and prayer. The sermons are relevant, straightforward and based on the Bible, designed to be helpful in everyday life. Our children and young people leave after the first 20 minutes for their own teaching and discussion groups. We also have crèche facilities, but we are more than happy for you and your baby to stay in the service, however, if you want to go out, we also broadcast the service onto a television in the church lounge. We don’t generally take an offering during the service, but if you would like to make an offering we have a box at the back of the church where you can donate. You should feel under no obligation to donate anything. Occasionally there might be a collection for a specific cause or charity, this will be explained during the service, but please do not feel that you need to contribute anything. If you do want to support the work of Caversham Baptist church please see click here for our giving page. What is there for children and babies? If you have a baby or a toddler we do have a crèche where you can take you child with toys and books. We also broadcast the service onto a TV in the church lounge so you can watch the service while looking after your baby. However, please don’t feel you need to take them out, they are quite welcome to stay in for the whole service. Older children stay in the main service until about 10:50 when they go out to our Children’s Church, this takes place in one of the rooms around the church. Here the children spend some time having fun and teaching in different groups according to their age. Your own children can of course join in with what’s going on or they can stay with you, whichever you feel most comfortable with. You are more than welcome to bring your children into the relevant groups – one of the stewards will be help you. All of our youth and children workers and helpers are CRB checked in line with our Church Child protection policy and have all undergone specific training. CBC is a dynamic church with people of all ages and backgrounds, everyone is welcome. Yes we have disabled facilities. There is disabled parking in the car park of the church and also an easy access ramp leading to the rear entrance. The welcome team are able to assist in guiding you to any of these facilities and also to convenient seating. The disabled toilet is in the main foyer of the Church. If you have any special requests please do contact us using the details below. What happens after the services? After the service please do come and chat to our leaders or the welcome team over a cup of tea or coffee, let us know your comments complete the welcome leaflet. If you would like us to contact you please also leave us your address. There is no dress code at CBC, we just ask that you do wear clothes! People tend to wear anything from smart casual to jeans and t-shirt. We have no preference, it is the person that is important not what they wear or how they look – so just come and feel comfortable with us. Is there a midweek group? 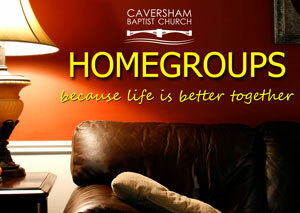 Yes we have a number of home groups which meet during the week at various places around Caversham. For more information on small groups and how to get involved please contact the church office. Or click here for our Home group page.